Trade union and human rights activists have intensified their protest campaigns in the United States (US) and the United Kingdom (UK) to create pressure on leading brands who are yet to sign a legally binding accord for improving safety standards in Bangladesh garment factories. Activists of several US labour rights organisations and scores of fashion models joined a protest organised by the Bangladesh Center for Worker Solidarity (BCWS) Executive Director Kalpona Akter in New York City (NYC) on Saturday, said an executive at the BCWS. 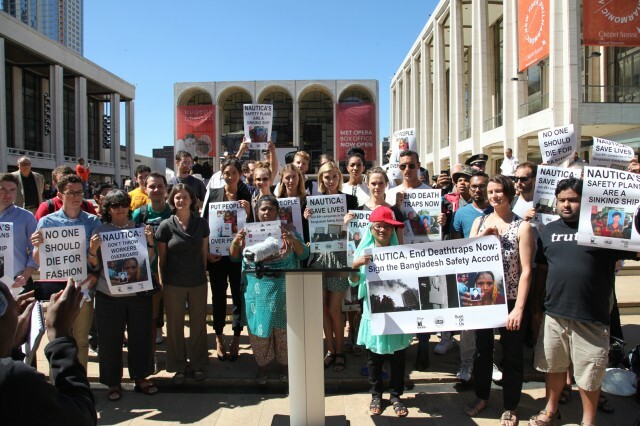 The protest was held near Lincoln Centre ahead of Nautica’s spring 2014 runway show, to create pressure on brands for failing to sign the Bangladesh Accord on Fire and Building Safety (BAFBS). The signatories to BAFBS include retailers and brands from 15 countries, including Britain, France, Italy and Japan. The brands also include Abercrombie & Fitch, Benetton, H&M, Inditex and Marks & Spencer. Labour federations and non-governmental organisations have joined the initiative. Meanwhile, in a separate event at the annual conference of the Trades Union Congress (TUC) held in London on Saturday National Garment Workers Federation (NGWF) of Bangladesh President Amirul Haque Amir urged leading retailers in the UK to sign BAFBS accord. Amir arrived in London on Friday to attend the conference, said a statement of the TUC. He warned the eight leading UK retailers, who attended the annual conference that there could be a repeat Rana Plaza tragedy if the brands refuse to sign up an international accord designed to protect Bangladeshi factory workers. More than 1,130 workers were killed and many maimed when Rana Plaza collapsed at Savar on the outskirts of Dhaka city on April 24. The US leading retailers Jansport and Vans owned by global brand VF is the parent company of Nautica which is currently sourcing its most merchandise from Bangladesh factories. But those US brands rejected the European-led BAFBS in favour of the The North American Pact (NAP) known as The Alliance for Bangladesh Worker Safety (ABWS), which was initiated in July. The NAP plans to develop a common safety standard for inspection by next month to determine which factories can be approved and which need upgrades. The American plan has been criticised by labour and consumer groups alike because it is not legally-binding, and therefore retailers face no real repercussions should they fail to meet the goals set. The protest in NYC was also participated by leading US fashion models, among others, by Sara Ziff, also the founder and director of Model Alliance. Most of the protesters were carrying placards, one of which carried a slogan: “No one should die for fashion,” according to US fashion newspaper fashionista. Ziff, who visited Bangladesh after the collapse of Rana Plaza, led a number of US fashion models including the gorgeous Alison Nix to support the cause. The organisers of the protest in NYC said that none of the companies which had used the factories in the collapsed Rana Plaza have paid any compensation to the families of the deceased. The protesters demanded that each and every company in the fashion industry (not to mention the government) should be held accountable for the tragedies and should finance the changes necessary to make the garment industry a safer work place. Addressing the TUC conference, Amir said several leading brands were still refusing to commit to the agreement that will make building inspections compulsory at Bangladeshi factories that supply fashion goods to UK stores, said IndustriAll Global Union in a statement on Saturday. He named the brands including Matalan, River Island, Sports Direct/Republic, Jane Norman, Peacocks, Bench, Mexx and Bank Fashion which were refusing to sign the European-led BAFBS. Meanwhile, the TUC is wooing consumers who have been shocked by the Rana Plaza tragedy to use social media to build pressure on the UK clothing brands that are refusing to sign up.